Review Nerves content from the Core before completing this topic. Fantastic resources available from Utah, including the mouse party, neuron and synapse animations and an interactive involving pedigree charts and the role of genetics in addiction. Spend some time here to really read around the subject of drugs and addiction – you’ll be glad you did and it really helps answer the ‘discuss the causes of addiction’ question! Jellinek is a Dutch drugs education website that has some great, accessible resources for neurobiology of drugs and the brain. Animations are available in multiple languages – why can’t more organisations be as internationally-minded as this? Be patient though -it needs a lot of bandwidth. How does this story show the conflict between science and politics? What do you feel the respective roles of science and politics should be in the government of a country? 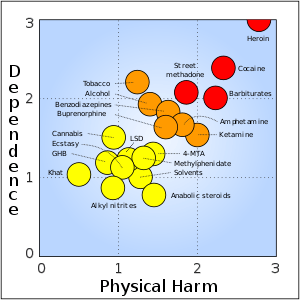 Suggest reasons why some drugs which are clearly very harmful, such as tobacco and alcohol, are still legal in many countries. If you were to form a new country and write a whole new set of drug laws, which would you make illegal or legal and why? Upon which sources of evidence would you rely in order to make your decisions? How would you balance political pressures with scientific evidence? Find out more about drug laws and the rationale behind them in your own country and the countries you visit or live in. Remember – regardless of your own opinion on drug laws, if you are caught breaking the law wherever you are, penalties can be very severe. Posted on February 2, 2010, in Ethics, Nerves and Synapses, Neurobiology & Behaviour and tagged Neurobiology. Bookmark the permalink. Leave a comment.